The objective of this work was to investigate the feasibility of co-pyrolyzing agricultural plastic mulch wastes with animal manures. Dried swine manure and spent fumigation plastic mulch were used as a hybrid feedstock for a batch pyrolysis reactor system. The reactor sample was heated to 500 °C at an approximate heating rate of 7 °C/min and stayed at 500 oC for 2 hrs before cooled down to room temperature. Gaseous, liquid, and solid end products were analyzed for their chemical and thermal properties. Preliminary results indicated that pyrolysis of spent fumigant plastic alone produced fumigant-free combustible gases, liquid oil, and paraffin-like waxes. Results from thermogravimeteric analyses and chemical characteristics of end products will be presented at the meeting. Why Study Co-Pyrolysis with Manure? Pyrolyzing livestock and agricultural wastes produces combustible gas and value-added biochar. However, the combustible gas produced from manure pyroysis alone does not provide enough energy to sustain the process. Spent agricultural plastics are usually disposed in landfills, which is not only expensive, but also not environmentally sustainable as the space for landfill is increasingly limited in the U.S. Pyrolysis of spent agricultural plastic produces high energy combustible gas, oil and wax. Thus, co-pyrolyzing animal manures with plastic may achieve an energetically sustainable pyrolysis process. The purpose of this work is to investigate the feasibility of co-pyrolyzing agricultural plastic mulch wastes with animal manures. Specific objectives are to 1) identify optimal pyrolysis processing conditions, 2) characterize byproducts, 3) evaluate potential pesticide emission, 4) perform energetics, and 5) determine biochar quality. A mixture (2:1) of dried swine manure and spent fumigation plastic mulch used for vegetable production was used as a hybrid feedstock. In addition, four different new plastic films (Hytibarrier, Thermic, Bayer CS, and 1 mil HDPE) frequently used as plastic mulch were pyrolyzed with the swine manure. Optimal pyrolysis temperatures for these hybrid feedstocks were determined via thermogravimetric analyses (TGA). Subsequently, a bach pyrolysis reactor system was used to pyrolyze the hybrid feedstock samples (21 to 54 g). The samples were heated without oxygen to 500 °C at an approximate heating rate of 7 °C/min and stayed at 500 oC for 2 hrs before cooled down to room temperature. Gaseous, liquid, and solid pyrolysis product were analyzed for thermal and chemical properties. 1. Nonisothermal plastic pyrolysis thermograms obtained at 10 oC/min heating rate is shown in Figure 1. The plastic samples decomposed rapidly at 450 oC, liberating volatile products. In contrast, swine solids decomposed rather slowly over wider range of temperatures (161 to 891 oC) with the maximum decomposition occured at 294 oC. The TGA results showed that pyrolysis temperature higher than 450 oC is necessary to completely decompose plastic samples and maximize combustible gas production, which can reduce energy requirement for pyrolyzing swine manure. 2. Selected fumigants (methyl bromide, methyl iodide, 1,3-dichloropropene, and chloropicrin) widely used for vegetable production were not detected in the used plastic mulch pyrolysis gas samples. 3. 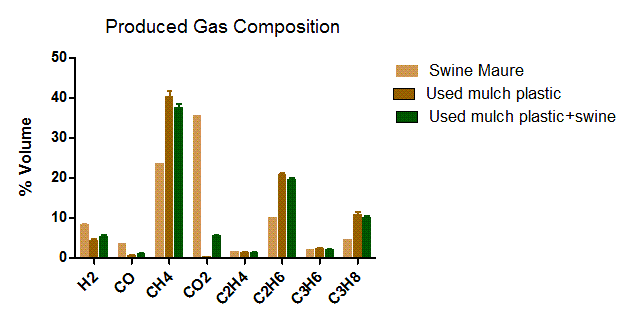 Production of energy-rich gases such as methane, ethane, and propane was substantially increased from co-pyrolyzing swine manure with plastic mulch as shown in Figure 2. Figure 2 – Major gas compositions of product gases from pyrolyzing swine manure, used plastic, and the mixture of swine manure and plastic mulch. Mass and energy balances of the pyrolysis reactions along with pytotoxicity of biochar produced from co-pyrolyzing swine manure and plastic mulch will be evaluated in the near future. K.B. Cantrell, P.G. Hunt, M. Uchimiya, J.M. Novak, K.S. Ro. 2012. Impact of pyrolysis temperature and manure source on physicochemical characteristics of biochar. Biores. Technol. 107:419-428. X. Cao, K.S. Ro, M. Chappell, Y. Li, J. Mao. 2011. Chemical structures of swine-manure chars produced under different carbonization conditions investigated by advanced solid-state 13C nuclear magnetic resonance (NMR) spectroscopy. Energy Fuels 25:388-397. K.A. Spokas, J.M. Novak, C.E. Stewart, K.B. Cantrell, M. Uchimiya, M.G. DuSaire, K.S. Ro. 2011. Qualitative analysis of volatile organic compounds on biochar. Chemosphere 85:869-882. K.S. Ro, K.B. Cantrell, P.G. Hunt. 2010. High-temperature pyrolysis of blended animal manures for producing renewable energy and value-added biochar. Ind. Eng. Chem. Res. 49:10125-10131. K.S. Ro, K.B. Cantrell, P.G. Hunt, T.F. Ducey, M.B. Vanotti, A.A. Szogi. 2009. Thermochemical conversion of livestock wastes: carbonization of swine solids. Biores. Technol. 100:5466-5471. This research was a part of USDA-ARS NP 214 Agriculture and Industrial Byproduct Utilization project. The authors are greatful to Mr. Melvin Johnson and Jerry Martin II for their technical assistance.